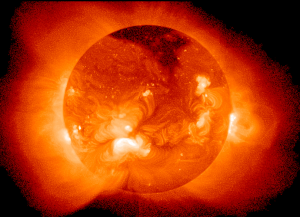 SOLAR ACTIVITY: The New Year began with a burst of solar activity. Active sunspot AR1936 is crackling with strong M-class solar flares, including an M9.9 event on Jan. 1st that stopped just short of becoming a powerful X-flare. Also on New Year's Day, another large sunspot emerged over the sun's eastern limb: AR1944 appears set to add its own contribution to the fusillade of explosions. Check http://spaceweather.com for updates and more information.